Acoustic guitar in Brisbane won’t get any better than you will find at Magda’s! Magda Community Artz and Guitar Brisbane are bringing some of the world’s leading classical and instrumental guitarists to Brisbane. 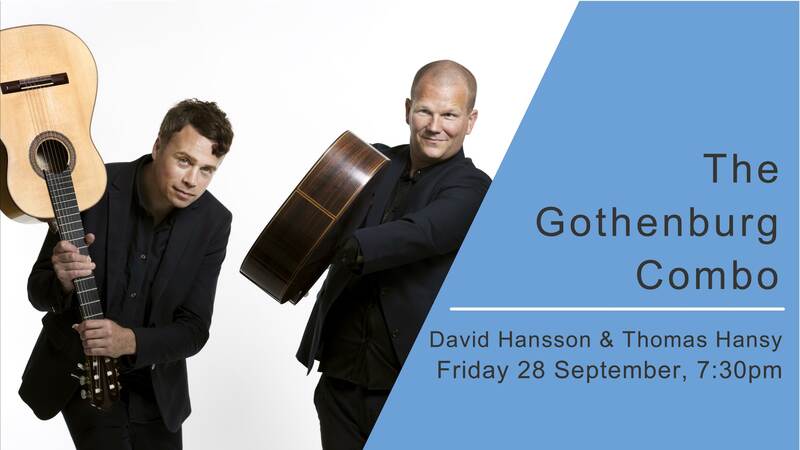 The Brisbane International Guitar Festival, the Swedish Arts Council, Guitar Brisbane and Magda Community Artz are delighted to bring to Brisbane the Gothenberg Combo. Presented by Magda Community Artz Assoc, Inc with financial assistance of Swedish Arts Council. Magda Community Artz wishes to advise that we have been far too successful – not just in bringing some of the nation and world’s leading guitarists to Queensland, but in all the genres we present. Although the 80 Boundary Rd site is a wonderful location and has glorious acoustics and delightful ambience, there are several reasons for needing a more spacious venue. Apologies if this appears to create uncertainty, but our events will continue to prosper and grow. Further queries, please email: magdacommunityartz@gmail.com or phone Mervyn: 0400 497 422. The Brisbane International Guitar Festival, Guitar Brisbane and Magda Community Artz are proud to present the New Zealand Guitar Quartet. Following a sold out 2017 tour of New Zealand, the NZGQ have been hailed as a national treasure, and have received funding help from the government backed Creative New Zealand to bring them to Brisbane in June. Originally based in Wellington New Zealand the NZGQ are now based on both sides of the ditch. Owen Moriarty and Jane Curry in Wellington, Vladimir Gorbach in Sydney and John Couch in Canberra. Internationally accomplished musicians, they play a wide variety of styles from American Bluegrass and Celtic melodies and dances to their critically acclaimed interpretations of Bach’s Third Brandenburg Concerto. Guitar Brisbane and Magda Community Artz are thrilled to present Franco-Spanish guitarist, Thibaut Garcia; winner of the 2015 GFA International Concert Artist Competition and Warner Classics recording artist. Thibaut is known for his virtuosity, freshness, spontaneity and interpretive gesture, using the guitar as a natural extension of his own voice. Don’t miss Thibaut’s only Brisbane concert as part of his Australian debut! Guitar Brisbane and Magda Community Artz are thrilled to present Spanish, flamenco inspired, classical guitarist José María Gallardo del Rey. Since his debut in Seville at the age of nine, José María has achieved universal public and critical acclaim. As a mature artist with a profound affinity for all aspects of the guitar, he has become a leading authority on the instrument among conductors and players alike, and a soloist in great demand by orchestras throughout the world. 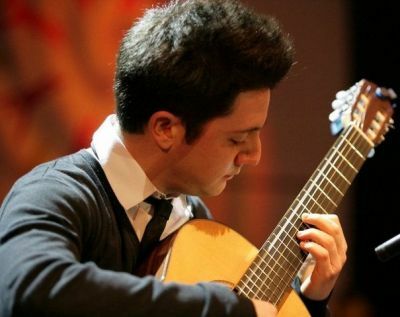 Lorenzo Micheli has taken up a busy concert career throughout the world since winning the first prize in some of the most prestigious international guitar competitions (Alessandria, “Guitar Foundation of America”). He has played more than 600 concerts all over Europe, in 200 US and Canadian cities, in Africa, Asia, Australia and Latin America, as a soloist and with orchestra. Since 2002 he has been performing worldwide in duo with Matteo Mela – under the name of “SoloDuo” – in such venues as New York’s Carnegie Hall, Seoul’s Sejong Hall, Kiev’s Hall of Columns and Vienna’s Konzerthaus. Their duo was welcomed by “The Washington Post” as “extraordinarily sensitive – nothing less than rapturous”. Plus MASTERCLASS by Lorenzo on Saturday 30th September at Magda’s with some of South-east Qld’s foremost guitarists. Clyde’s Water is the stunning new album from esteemed Scottish traditional singer Fiona Ross, with master of Celtic guitar, Tony McManus. A superb example of the traditional style, this album brings together Fiona’s honest, evocative singing and Tony’s unrivalled guitar-playing to showcase Scottish songs in all their richness and diversity. Fiona grew up in Partick, in the west end of Glasgow, also spending time at her step-family home in North Tolsta on the Isle of Lewis during her teenage years. The youngest of a busy household of five children, she inherited a love of Scottish music from her dad, and began singing popular Scottish songs from a young age. It was in the 1980s that Fiona truly embraced the Scots song tradition, immersing herself in Edinburgh’s vibrant folk scene and serving her apprenticeship in the folk clubs and memorable singing sessions of the time. She was fortunate to be singing at sessions in the company of many fine singers who remain at the heart of the tradition in Scotland and who are some of Fiona’s favourite singers to this day – Aileen Carr, Maureen Jelks, Cy Laurie and Danny Couper to name a few. Fiona then joined the group Handsel with Scottish folk scene stalwarts Brian Miller, Gavin Livingstone and fiddler Anna-Wendy Stevenson, performing at traditional music festivals around the country. Since moving to Melbourne in 2009, Fiona has continued to pursue her passion for Scots song. In addition to her busy schedule of concerts, workshops and talks, she is currently completing a PhD through the University of Melbourne Conservatorium, working with traditional singers in Scotland and overseas to explore and document the importance of a singing style and tradition that is now rapidly changing. As a singer of Scots song, Fiona was mentored by esteemed tradition bearer Andrew Hunter. Tony McManus has come to be recognised throughout the world as the leading guitarist in Celtic Music. From early childhood his twin obsessions of traditional music and acoustic guitar have worked together to produce a startlingly original approach to this ancient art. In Tony’s hands the complex ornamentation normally associated with fiddles and pipes are accurately transferred to guitar in a way that preserves the integrity and emotional impact of the music. His playing described by Tommy Emmanuel as “beyond beautiful” and deemed by John Renbourne as the “best Celtic guitarist in the world” – Tony McManus presents a virtuoso performance of guitar styles from around the world, played equally with passion, precision & astounding technique. Brisbane-based, three times Golden Guitar winner Michael Fix is known as a leading exponent of contemporary acoustic guitar, and a consummate performer. His fretboard skills, unique style, and good-natured humour have earned him an international reputation as a concert drawcard – with a sound that is distinctively Australian and highly original in its presentation. Over the past two decades, he has released 15 albums. His latest release is the evocative Bending Air, which features a collection of exquisite new original pieces, together with unique arrangements of some of the songs that have inspired him over the years. Recognized world-wide as a performer who has a quirky take on everything around him, Richard Gilewitz continues to live up to this depiction with rousing shows filled with offbeat observations combined with his right-hand wizardry and technique. Much of the charm of a Gilewitz performance is in the humorous stories he tells. Whether playing solo, conducting guitar seminars and school programs, or sharing the stage with folks such as Stephen Housden, Brooks Williams, Michael Fix, The California Guitar Trio, John McCutcheon, John Renbourn, Mose Allison, the late John Fahey, Leo Kottke, Norman Blake, Indigo Girls, or John Hammond, Richard always invites the audience to join him on a journey filled with twists and turns at every tune. Swedish born, Johannes Möller’s close collaboration with the Argentinian guitarist Laura Fraticelli have resulted in a unique form of musical expression. Their emotional playing style as well as their strong connection and stage presence make their performances unforgettable events. Möller-Fraticelli Guitar Duo have performed throughout Europe, North and South America as well as on radio and TV. Their repertoire includes Johann Kaspar Mertz (1806-1856), and Argentinean tangos originally composed for guitar duo as well as their own original compositions. European guitarist and composer Johannes Möller has captivated audiences throughout the world with charismatic and soulful performances. Based in the Netherlands, Möller was awarded First Prize in the 2010 Concert Artist Competition Guitar Foundation of America (GFA) – considered by many to be the most prestigious guitar competition in the world. As a performer his artistry has reached well beyond the usual guitar circles. This was confirmed when he won the Ljunggrenska Competition (Sweden, 2007) and the Dutch Vriendenkrans Concours (2008) while competing against performers in all instrumental categories. “Johannes Möller achieved miracles with his lucid, spacious playing.” London Evening Standard. * In September 2016, Johannes become the head of classical guitar studies at the Conservatorium van Amsterdam. Johannes has been working with students at the conservatory for some time. * “ Johannes Möller is not only a guitarist with a brilliant technique. He has something more. A charisma which transforms him to something more than just a man with his instrument. Listen to the solo introduction in Leo Brouwer’s Concierto Elegiaco for guitar, strings and percussion. The Cuban origin permeates this delicious work. Möller is magnificent with his shimmering guitar playing. It is breathtaking, devotional and masterful.” Norrländska Socialdemokraten. Born in Buenos Aires, Argentina, Laura Fraticelli studied with Tzvetan Sabev, Walter Ujaldón and Eduardo Fernández. A love for music gave her the courage to emigrate to Europe where she continued her studies at the Royal College of Music in London with Carlos Bonell and then later at the Royal Conservatory in The Hague where she was accepted in the class of the renowned guitarist Zoran Dukic. She has been praised for her beautiful tone and passionate interpretations. Gian Marco Ciampa, the wonderful Paul Svoboda, the Aurora Guitar Ensemble and The “BIG Fest” Ensemble: Michael Patterson, Flora Wong, Eugenie Costello and Danielle Bentley. What an unbelievable weekend of music at Magda’s “Brisbane International Guitar Festival”! A huge thank you to Michael MacManus and Evan Hopkins (MGF), for making this possible! In conjunction with the Melbourne International Guitar Competition 2016, The Melbourne Guitar Foundation, Magda Community Artz is delighted to bring musicians like Adriano and Gian to you! Adriano del Sal, highly acclaimed, classical guitarist and winner of multiple international awards, including the 2009 du Concours Tárrega International Guitar Competition, will present his only Queensland concert at Magda’s 80 Boundary Rd, Bardon. Gramophone (“the world’s best classical music reviews”): ” … It’s not often you get to hear Fernando Sor and Ennio Morricone on the same programme. But that’s just one of the attractions in this enjoyable recital by young guitarist Adriano Del Sal …. Admittedly Carlo Marchione’s arrangement for solo guitar of the famous “Gabriel’s Oboe” from Morricone’s score for “The Mission” is strictly encore fare, and Del Sal does well to perform it last here, where it makes for an enjoyable after-dinner mint.”We promise we’ll have lots of after-dinner mints here for you on October 1st!